Visualize the unseen paths of car tailpipe emissions at the EZ-GAS: Imaging for Car Emissions Characterization exhibit at the Imagine RIT: Innovation and Creativity Festival on May 6. Visitors to this year’s Imagine RIT: Innovation and Creativity Festival on Saturday, May 6, can see first-hand the effects of car tailpipe emissions using infrared light at the EZ-GAS: Imaging for Car Emissions Characterization exhibit. Twenty-three Ph.D. students from the Chester F. Carlson Center for Imaging Science have been working on the project since the fall. 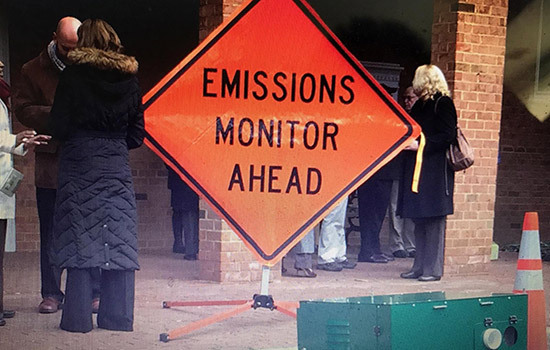 The technology these students are developing is not just for show—they are designing it to be used as a new way to conduct state-mandated vehicle emissions tests. “States are moving toward testing car emissions remotely instead of requiring people to take their car to a local autoshop,” said Catherine Fromm, an imaging science doctorate student from Rochester, N.Y.
Until the technology can be widely adopted, the students want to at least provide drivers food for thought about their purchasing habits. “We hope our exhibit encourages people to think about the types of cars they drive and think about purchasing one that emits less harmful gases,” said Fromm. You can find the exhibit in the Recreation Zone inside the Gordon Field House. To learn more about Imagine RIT and plan your day for May 6, go to rit.edu/imagine.